Well, actually I found a new drug. 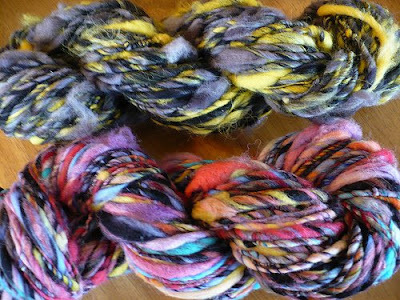 Handspun yarn. And my dealer is MaraJane. Okay, her name is Mary. This isn't starting off well. Okay, starting over. This has nothing to do with drugs. So I had met Mary briefly a couple of times at Craft Saturday, but that was before I was a knitter. I had ooohed and ahhhed over her yarn but never bought any because I didn't know exactly what to do with it. 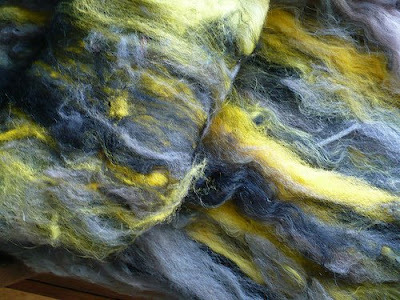 Now that I have spread my knitting wings, I emailed (okay, Twittered) her to see if she could spin some custom yellow/gray/black texturey yarn for me. And lucky for me, she took pictures of the process... this is how it started. ...95+ yards of my perfect yarn. 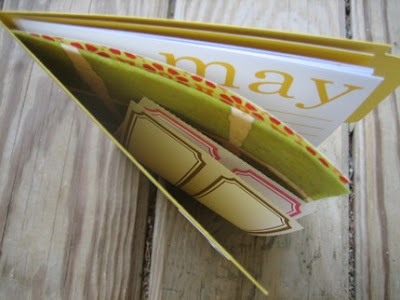 She added in different fibers to make it super rad. And then, as I was browsing through her Flickr photos, drooling over my new yarn, I came across this picture. My yarn, and apparently, my yarn's best friend. 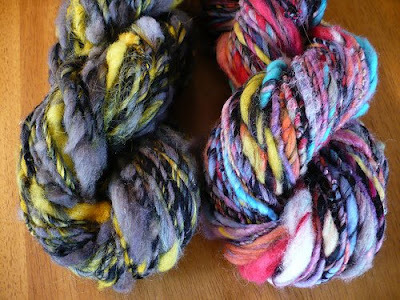 Lucky for me, this fantastically cool multicolored skein wasn't sold yet, so I got them both. And I've been knitting ferociously ever since they arrived at my house in the mail on Saturday. Watch out, I have found my calling. I seriously can't put this stuff down. I was really inspired after reading an interview with Diva Zappa in the new issue of Knit.1. That girl is killer cool. 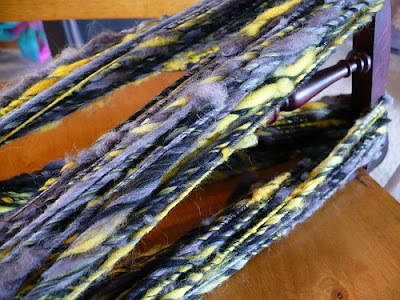 I'm working on a project with the black and yellow skein first. I'm not going to tell you what I'm making yet, but I've already named it "Iron Maiden." Anyway, yarn lovers – definitely go check out marajane creations on Etsy. She's crazy talented and I have been (obviously) very happy with the quality of her yarn. The colors, the softness... everything. Pictured above is another skein I bought from her awhile ago and it is sooooooo much softer and warmer and comfier than I had ever anticipated. And incredibly fun to knit with. 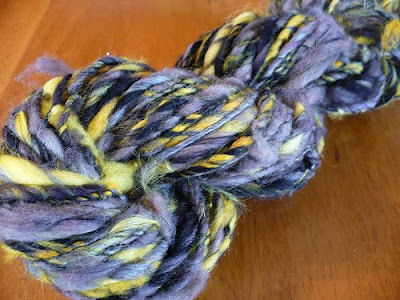 I don't know why, but I had assumed that handspun might be a little bit coarse or scratchy but I was so wrong! It's probably the softest stuff I've used yet. Get yours now while you can... I'm guessing they won't last long! I think I'm venturing out to Mars Café for this. I know, I know, I knit... but crochet is super intriguing and I would love to use the two together. 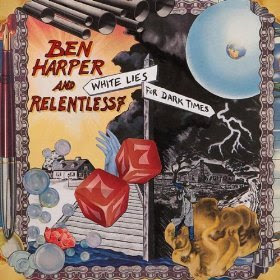 And today I bought the new Ben Harper and Relentless7 album here for only $3.99 in anticipation for 80/35 later this summer. Excited to give it a listen. thanks for the shoutout love! I just dropped yours in the mail. That is Beautiful yarn!! I cant wait to see what you turn it in to! 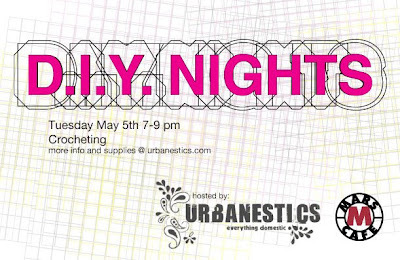 Have fun at crochet night, Im sure you will learn some quick and easy project that wows everyone! Hope you and the fam are doing great!! 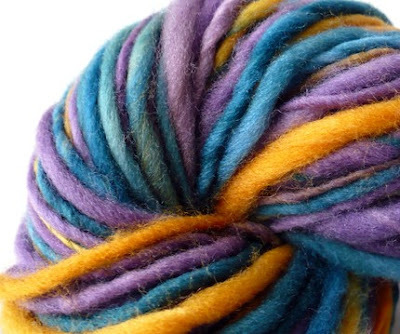 the spun yarn is pretty! that yarn looks so soft and cuddly! 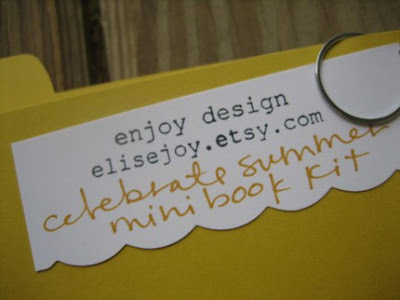 I think it would be so weird to hear and see my bloggy friends. Just because I have talked to some so much, for so long, and have my own ideas of what they are like in my head. When I met my frist bloggy friend, I was totally taken back. haha :-) It is definitely cool and interesting to meet for the first time, without ever seeing their expressions. ha! i just realized i don't have patty's blog on my roll. thanks! and yeah, you first with the video, g! i'll do one soon. and that multi yarn?! holy geez, that's beautiful! wow. HI!